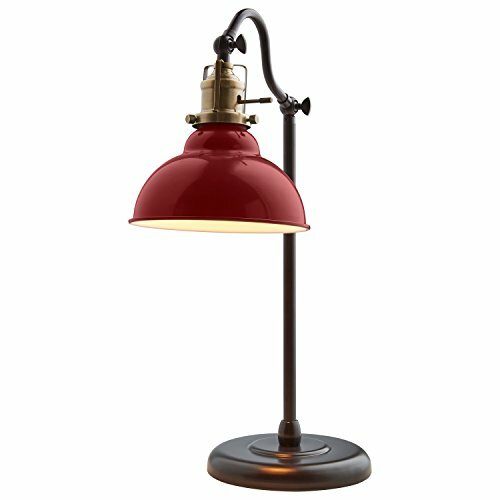 An Amazon brand - This task lamp brings a fun twist on modern vintage to your desk. An eye-catching red metal shade is combined with an oil-rubbed bronze base and rod. The arced arm adjusts to cast light where you need it, and the base includes a USB port. This task lamp brings a fun twist on modern vintage to your desk. An eye-catching red metal shade is combined with an oil-rubbed bronze base and rod. The arced arm adjusts to cast light where you need it, and the base includes a USB port. If you have any questions about this product by Stone & Beam, contact us by completing and submitting the form below. If you are looking for a specif part number, please include it with your message.